Happiness Unlimited...: Does God exist? A scientist was travelling in a train, when he saw another person sitting right in front of him reading the holy Bible. The person reading the bible seemed very well educated and from a good family background. He was also young and looked thoroughly professional. A Bible in the hands of a young educated professional was somehow disturbing this scientist. "Hello gentleman, you seem so educated and professional. Still you believe in God and read this Bible. I am a scientist and i can tell you that every situation of your life can be proven scientifically. Do you really believe there is God?" The person reading the bible smiled and closed the Bible. He stopped reading, and did not offer any response. He knew that this guy would never allow him to read his Bible. The trains reached the station where both of them got down. The person who was reading the bible offered his visiting card to the scientist. The scientist took it casually before he read the card. The person reading the bible was none other than Albert Einstein. Thrown aback at this surprise, the scientist seeked an appointment with Albert Einstein, and Einstein did oblige him with an appointment for the very next day. On the appointed day, the scientist met Albert Einstein. As soon as he entered the meeting room, he saw a perfect model of a solar system in front of him - with all planets, stars, and universe depicted to perfect detail and sizing. It is always difficult for any scientist to curtail his curiosity. So, he asked Albert Einstein as to whether he created that beautiful perfect looking model. "Then? Who created? This looks very good." "Well, no one actually. This model just appeared yesterday night from somewhere." responded Albert Einstein. The scientist started laughing. He said "Sir, i never knew you had such great sense of humor. OK, i will not tell anyone else about this, but at least tell me who created this beautiful model." "No, i am not joking, this just appeared yesterday night of its own. No one has created it." responded Einstein. The other scientist now got agitated. "Sir, you and I know that it is against the fundamental laws of physics. If there is a model in front of us, then someone must have created it." "Why do you say so? When you and your entire scientific community can believe that the entire actual universe can get created of its own, then why can't a model appear of its own? Why do you think there has to be a creator for this?" responded Einstein. The scientist was getting the message. 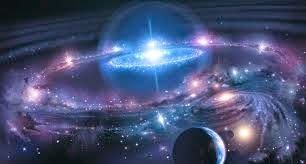 If there are actual sun, planets, stars, universe, nature - if there is this entire creation in front of us, then there has to be a creator for all this. Understanding the creator (the God - the supreme soul) and understanding its creation (all of us - the souls) is the most vital education you would ever undertake in life. Need help in understanding more about God and yourself?